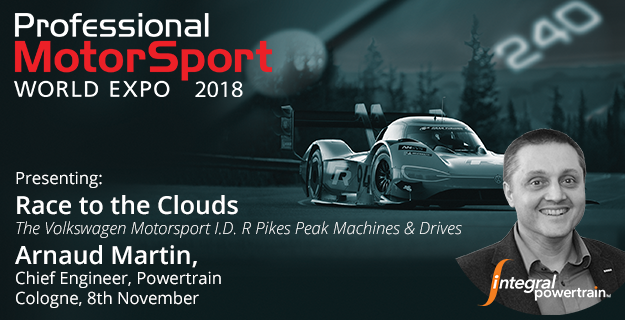 Join Arnaud Martin, Chief Engineer Powertrain at Integral e-Drive, as he presents ‘Race to the Clouds’ The Volkswagen Motorsport I.D. R Pikes Peak Machines and Drives. Arnaud will be presenting within the Professional Motorsport WORLD EXPO Electrification and Hybridisation in Motorsport session at 10:30 on the 8th November. The EXPO runs from the 7th-9th November within the Cologne Messe where a range of Motorsport electric drive technologies will be on display (Integral e-Drive stand 3066). On the 24th June 2018 Volkswagen’s all-electric I.D. R car won at the famous Pikes Peak International Hill Climb race, not only breaking the EV record by 60 seconds, but also Sebastian Loeb’s Peugeot 208 T16 2013 record by an incredible 15 seconds and the magical 8 min barrier; a time that many thought would never be achieved. This was followed up by an outright win at the 2018 Goodwood Festival of Speed hill climb shoot out; smashing the existing electric record time by 3.5 seconds and setting the 3rd fastest time ever recorded. Integral Powertrain supplied the machines and drives for the car. Breaking with the usual tradition of secrecy surrounding top end Motorsport, this presentation will reveal in detail facts about the technology. It includes the next generation silicon carbide inverter, and how the motors and inverters were applied to the car. Arnaud joined the Integral e-Drive team having led a number of world title winning Motorsport powertrain programmes. He is well known and respected within Motorsport. Matching his knowledge and experience, gained over 20 years, with market leading e-Drive technology from Integral Powertrain has created a increasing number of high profile successes throughout Motorsport. As well as a growing number of applications within the automotive market. Integral e-Drive’s intense focus on innovative electric motor technology advancement is designed to maintain a technology leadership position. This is critical to supporting its Motorsport clients. At the same time it is taking the lessons learnt to automotive with the ‘Track to Road’ programme. This has created wider interest from industries that seek clean, quiet, power-dense and efficient drive technologies to develop new mobility solutions for the 21st century such as the Aerospace sector. Arnaud successfully delivers challenging programmes in remarkably short periods. He’s supported by unique ‘rules based’ engineering systems created by Integral e-Drive. Challenging compromise at every level, the Integral e-Drive team is able to quickly create technologies to precisely meet a client’s requirements with a high level of confidence. Technology leadership, R&D focus and speed of delivery from a partner that knows how to deliver within a highly collaborative and focused project has made Integral e-Drive a very productive team member.